Best Mattress for Shoulder Pain. Sleep away soreness. Shoulder pain while sleeping is a surprisingly common issue. It’s especially common among side sleepers, especially those whose mattress doesn’t allow the shoulders to sink into the bed to relieve pressure. We’ve rounded up several of the best mattresses for shoulder pain issues, and included them in this handy guide. It’ll tell you everything you need to know about shopping for a bed that relieves shoulder pain, and explain why we think our recommendations are the best at doing so! The most important thing for any mattress and topper to do is accommodate your preferred sleeping position, whether you like to sleep on your back, side, or stomach. Most people who experience shoulder pain sleep on their side, so we’ve taken care to find beds that are compatible for side sleepers as well as back sleepers! Shoulder pain is an acute pressure symptom, which is aggravated when a mattress builds up pressure at the point where the shoulders contact the sleep surface. We’ve looked for beds with specific pressure relief features, like memory foam comfort layers and gel cushioning. One of the trickiest things about finding a bed that relieves shoulder pain is getting a model that can allow your shoulders to sink in enough to give you pressure relief without curving your spine or crunching your neck. Our recommendations will help you find that sweet spot! The most affordable mattress we recommend for people who experience shoulder pain comes from DreamFoam. It’s a 10” all-foam mattress that comes with a lot more depth and comfort features than you’d expect for the price. It’s got plenty of cushion for pressure relief, but there’s still enough support to keep your spine straight. We also love the cooling gel foam for keeping heat pools from forming. 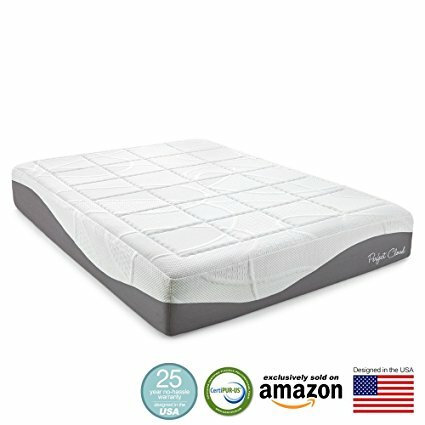 If you’re on a budget trying to relieve your problems, try this because it might be the best mattress for sore shoulders. 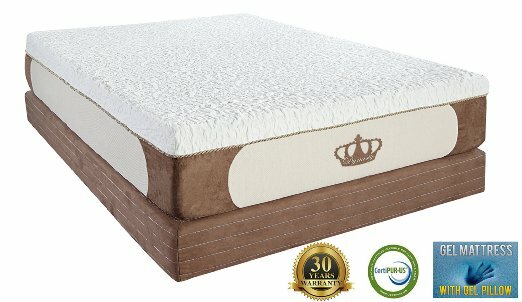 It's a medium firmness bed, which gives you a lot of depth for the price. That’s a big advantage for side sleepers in particular. At 10” this is a lot thicker than other beds that cost the same. It has a full 3.75 inches of comfort foams, with a 3” layer of gel foam under a .75” pillow top. Underneath, there’s a 6.25” block of support foam (topper) for structure and spine support. Energex gel foam in the comfort layer feels like latex, but is still deep enough for side sleepers. We prefer it over other budget foams because it gives you the adaptiveness of memory foam with more of the springy, responsive quality of latex. It keeps you from sinking through the torso, while relieving pressure points at the hips and shoulders. On the whole, reviewers reported that this one struck a great balance of cradling comfort and support. They especially liked the Energex layer, and said it helped them avoid that “sinking” feeling which is so common to other memory foam beds. Buyers who said they’d never been able to sleep all night in one position said that they felt so cradled that they could relax completely and get more restful sleep than they’d had with previous beds. However, they said they could still get out of bed comfortably and without shoulder soreness thanks to the springy quality of the gel foam. It’s one of the cheapest mattresses you can find that’s made completely in the USA. A lot of inexpensive foam beds are made overseas where chemical regulations aren’t very strict and quality control is quite lax. That can lead to bad allergic reactions, putrid odors, and malformed mattresses. DreamFoam buyers said they were grateful to avoid those worries. The materials are Certi-Pur certified to be free of harmful chemicals, and low in VOC content. It doesn’t last as well as more expensive mattresses. A few reviewers noted that after a year or more of use, their mattresses weren’t quite as firm as they had been previously. However, most folks didn’t run into problems, and any issues that come up should be covered under the warranty. Still, budget mattresses like this are never as long-lasting as more expensive models. It’s fairly soft, so it might not be great for heavier users, especially heavier folks who sleep on their backs. Some buyers weren’t as impressed as others with the cooling features. Even though this is a Certi-Pur certified mattress, some buyers still reported fairly strong odors out of the box. You should plan on airing out any new foam mattress, but in this case, a few extra hours wouldn’t hurt! If you’re super sensitive to chemical smells, you might want to spend more for something less stinky. Our midrange recommendation for people with shoulder pain is this Dynasty Mattress Cool Breeze. This is one of the most popular memory foam beds on the market right now!It’s an even thicker, more supportive cushion than the DreamFoam, with a deep gel foam comfort layer to relieve shoulder pain, and special ventilation foam to dissipate heat under your shoulders and hips. Since it’s slightly firmer than the DreamFoam, it’s a better choice for back sleepers, and for heavier side sleepers, as well as those who simply prefer a firmer mattress. So, if you are experiencing should pain in bed then you should give the Dynasty brand a shot. Because you're spending an average of 6-8 hours a night on your mattress, so it's important to have cushion that is suited for your needs. It’s even thicker than the DreamFoam, at 12”. The Cool Breeze is definitely a mattress that feels deluxe, and it has the depth to really relieve shoulder pressure for side sleepers. There are four different foam layers: a 3” block of gel foam on top for comfort and pressure relief, two 2” slabs of ventilated foam in the middle, and a 6” support block underneath for structure. It’s a medium-firm mattress, so it’s slightly more supportive than the DreamFoam. That makes it better for back sleeper’s spines, and helps it hold up longer. Reviewers said it definitely qualified as a firm mattress, but still adapted to the contours of their body. As with the DreamFoam, it has lots of cooling features to help side sleepers out. The top 3” gel layer dissipates body heat evenly. Underneath, there are dual 2” slabs of “airflow” foam which help air ventilate heat from your body to the outer edges of the bed. Reviewers said they didn’t have any problems with overheating. Reviewers with chronic shoulder pain said that even though it was fairly firm, it still relieved pressure. Others said that while previous soft beds had relieved pressure, they had cause more back pain by sinking in too severely. They thought the Cool Breeze struck a much better balance between support and cushion. Buyers with shoulder, back and hip pain all said they found relief, as did folks with sciatica. In short, this is a luxurious, supportive mattress that’s good for relieving all sorts of chronic night aches. It comes with some of the best buyer-satisfaction coverage on the market. There’s a full 30 years of warranty coverage, and a 120-day comfort guarantee! That’s 4 months where you can test out the mattress to make sure it’s going to work for you. It’s almost twice the price of the DreamFoam. If you can’t spend $500+ on your new bed, this one might be inaccessible to you. It’s fairly smelly. A fair number of buyers commented about the chemical odor out of the box, and while most people found that it dissipated quickly, others found it too much to tolerate. It’s not made in the USA. However, the materials are still CertiPur US certified. Some people simply found it too firm. This is definitely better for back and stomach sleepers than side sleepers, although we do think the extra firmness would be a good match for heavier side sleepers with shoulder issues. ​Definitely one of our top choices for the "best mattress for upper back and shoulder pain". The Perfect Cloud 12 Inch surely won't disappoint you once you give it a try. Its super comfortable cushion and material will give you the sleep of your life. Our ultimate choice for folks who have chronic shoulder pain while sleeping is this Perfect Cloud mattress. It’s one of the most luxurious beds on the market, and you could think of it as an upgraded version of the Dynasty Mattress. It’s about the same size, but it has a better balance between firmness and cushion. There’s also a superior comfort layer topper which we think is perfect for side sleepers who need shoulder relief that won’t curve their spine. It’s just as thick as the Dynasty Mattress. This one’s a full 12” thick. There are dual comfort layers on top. First, a 1.5” slice of HD air foam, which is slightly denser than the second 1.5” section of air foam underneath. In the middle, there’s a 2” layer of gel foam which is responsive and supportive like latex, while still allowing for some pressure relief in the shoulders. At the base, it has a thicker support layer than our other recommendations, which makes it better at keeping your spine aligned. Overall, it’s a good middle ground between the softer DreamFoam and the firmer Dynasty Mattress. It actually has a higher density comfort layer on the top, which helps support your torso while your shoulders and hips sink slightly into the bed. With a lot of other foam mattresses, the comfort layer is super soft, which allows your midsection to curve too severely. This one is better at supporting that midsection alignment than our other recommendations. It’s the least smelly of the three. Although it’s made in China like the Dynasty Mattress, far fewer Perfect Cloud buyers complained about chemical odors out of the box. It has the best cooling features of the three, too. Instead of having the ventilation layers buried in the center of the mattress, the comfort layers on top are designed to be more airy. So, heat is dispersed right where it collects in the foam! That’s a smarter choice in our book. There’s also the gel layer in the heart of the cushion, which dissipates heat as well as the air channels in the Dynasty Mattress. It’s covered by a 25-year warranty, and a 30-day comfort guarantee. As with the Dynasty Mattress, it’s not made in the USA. However, the materials are still Certi-Pur US certified. Most reviewers didn’t notice any particular strong smell, but we would still recommend on planning to air this bed out, as you would with any new memory foam product. It’s about the same price as the Dynasty Mattress. That’s good in the sense that you’re getting a better mattress, in our opinion, but it’s still going to cost you more than $500. Some people had mixed experiences with longevity. While most buyers didn’t report any troubles, some reviewers noted that their beds weren’t maintaining their proper, uniform shape after a year or more of use. There are always a few abnormalities to be expected in memory foam mattresses, especially when they’re made in China. We couldn’t find out how those experiences were resolved through the warranty coverage, but the 25-year policy should certainly cover any issues. So, which of these mattresses should you spring for? 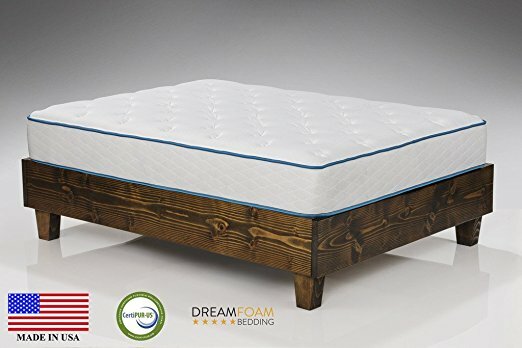 If you’re on a tight budget, there’s no question that the DreamFoam is the mattress for you. It’s also the best choice for people who like softer mattresses. We also appreciate how much cooler it sleeps over other budget cushions, as well as the USA build quality! Just don’t plan on it lasting quite as long as more expensive beds, or providing as much support as our firmer recommendations. If you have a bit more money to spend and appreciate more support, the Dynasty Mattress is a great midrange choice. It’s the firmest of the three, and it’s as thick as the Perfect Cloud for a slightly lower price. It has great cooling features, and excellent warranty coverage. However, it might be too firm for some lighter side sleepers. For the best balance between firmness and cushion, choose the Perfect Cloud. It has more support than the DreamFoam, but more contouring than the Dynasty Mattress. It also combines the two other beds’ cooling features in one design. In short, it’s a perfect recipe for shoulder pain relief! The vast majority of sleepers who report overnight shoulder pain sleep on their sides. When you sleep on your side, your hips and especially shoulders need to be cupped by the mattress more than they would on your back. To accommodate for the natural shape of your body, you want a medium-soft to medium bed that allows your hips and shoulders to sink in while maintaining a straight spine all along your back and neck. Firm mattresses can make side sleepers uncomfortable, because they don’t allow your shoulders and hips to sink far enough into the bed. That creates a dip in your spine along your torso, which can be a major source of back pain, and have a negative effect on your posture. Avoid soft mattresses unless you’re very light, since they create too much spinal curvature by allowing your whole torso to sink into the bed. If you have shoulder pain and sleep on your back, you may be more comfortable with something in the medium-firm range. However, side sleepers should rarely buy on the firmer side, unless you’re a particularly heavy person. Most people who experience overnight shoulder pain are side sleepers whose shoulders and hips sink further into the mattress than folks who sleep on their backs. Since those parts of your body are cupped by the mattress more completely, they can also form heat pockets which might get uncomfortable, especially with memory foam. If that’s something you’ve experienced in the past, make sure to buy something with cooling features to help minimize the heat buildup! Hopefully, you’ve seen at least one mattress in this guide that looks like it’ll be up your alley! If you have, all you have to do is click on the links in the review to find out more about it, and check current prices. Still searching? We’ve only recommended a small number of mattresses here, but we’ve got lots more recommendations on our home page, or on our Best Mattresses for Side Sleepers page! Check those out to find more options for relieving your shoulder pain.